Bangkok (Thailand) – November 6, 2018 (travelindex) – In Thailand, tourism industry is one of the main industries that generates huge amount of income to the country. It is an industry that is relevant to many people from various sections. Tourism Authority of Thailand, the organization that is responsible for the promotion of Thailand’s tourism market, realized that to create an effectiveness, all sectors including stakeholders in the travel industry must be consistent to be able to make Thailand’s tourism industry sustainable. “When the tourism sector is larger, it is inevitable that more people will be involved. So, we need to understand the context of the work and who are we going to work with. In addition, we need to know the needs of those involved in the work and stakeholders who help TAT to be in line with the objectives; How will TAT be the leader in tourism promotion and how will TAT make Thailand a popular tourist destination? 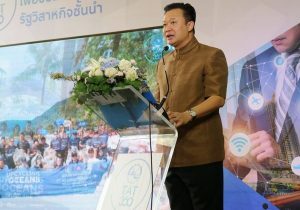 To be in line with these objectives, TAT need to adjust an organization structure to be a well-rounded organization to step up as a leading state enterprise.” said Mr. Yuthasak Supasorn, Governor of Tourism Authority of Thailand (TAT), who revealed the process of an organization adjustment to be in line with TAT 360. TAT has adopted the TAT 360 model, a model of developing workers to be “knowledgeable” means that they can be able to improve and disseminate the knowledge on tourism information nationally and internationally, and “well-rounded” means they are paying attention to natural resources, social impact and stakeholders in the tourism industry. TAT 360 is considered as the strategy to increase work efficiency of the organization that will contribute to the sustainability of the Thai tourism industry, and for TAT to become a leading state enterprise according to the criteria of the State Enterprise Policy Office (SEPO). Mr. Yuthasak added that the work structure does not change but will be more concentrated in terms of collaboration of the people in the organization. Every part of the organization, including employees at all levels, involves in creating a quality organization such as sharing opinions, creating organizational awareness, or exchanging information between the parties to achieve good coordination. “The activities will be implemented in form of online activities and there will be a central space to be a platform for creative expression. For example, we have an activity called Share Your CG that everyone can forward their favorite CG or an activity called TAT Hero a quiz activity that aims to raise awareness about good governance. Not only adjust the work process, but the new TAT also adds new projects and missions under the direction of Mr. Yuthasak who believes that every change will contribute to the development. Whether it is to adjust the work process by implementing TAT 360 model or to create activities that instill TAT’s vision to people in the organization, the main goal is to develop the organization to become a leading state enterprise with quality work, quality people, strong network and transparency. Mr. Yuthasak emphasized that TAT wants to be a recognized as a leading state enterprise.